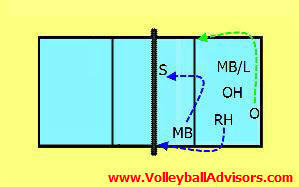 Read about 6 positions of volleyball. Find out how volleyball players line up on the court. 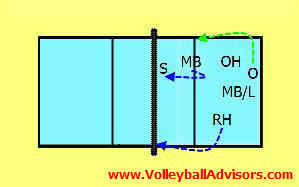 Volleyball Rotations - How to Call Volleyball Court Positions? Instead of Position 1 or Zone 1, coaches often call these rotating positions..
Other commonly used line up is 6-2 rotation. The only difference is when running 6-2 the opposite is replaced with another setter. It allows team to have three hitters in the front row in all the rotations. How to remember your playing position? Please notice it is possible to set up 6-2 line up with other ways also, but the previous one is the most common form. The basic idea is: the setters, middle blockers and wing hitters (outside hitter/right side hitter) are opposites of each other. Several leagues in United States have unlimited substitutions, therefore 6-2 offense is commonly used formation there. Coaches are able to replace the front row setter with a hitter with no substitution limits. The following image is the same 6 positions of volleyball with abbreviations - to help you to comprehend the line up sheets below. "Right back" is the position in the defensive zone (or back row) on the right side of the court (when looking at the court behind the back line). This position can be called "right back", position 1, P1, zone 1", "Z1". Setter usually starts the game on the right back position. Setter starts from the right back because it allows having three front row attackers more often. 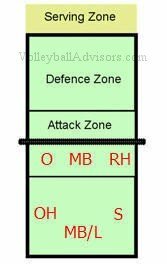 Opposite (the player opposite of setter) is the other player who plays "zone 1", it allows opposite to perform 3 meter or 10 feet attack from the right side of the court while the setter is playing right front position (position 2). "Middle back" is the position in the defensive zone (or back row) on the middle of the court. This position can be called "middle back", position 6, P6, "zone 6:", "Z1:". The middle blocker usually starts the game in the line up on the middle back position, but is generally speaking replaced by the libero, a back row specialist before the first serve. In competitive volleyball liberos rarely play on this position on the rallies, but are changed to left back position after the serve when appropriate. 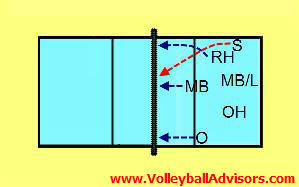 Outside hitter or right side hitter usually plays in the middle back position because it allow them to hit the ball from zone 6. "Left back" is the position in the defensive zone (or back row) on the left side of the court. This position can be called "left back", position 5, P5, "zone 5", "Z1" . 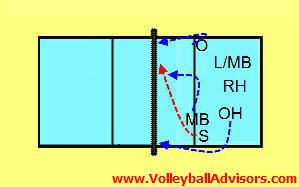 Most often the libero plays position 5, or alternatively the middle blocker on one rotation after his/her own serve. After the serve libero usually subsitutes in for the middle blocker. "Left front" is the position in the attack zone (or front row) on the left side of the court. This position can be called "left back", position 4, P4, "zone 4" , "Z4" . 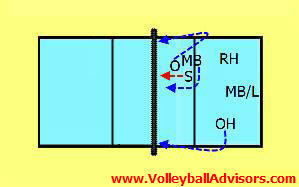 Most often the outside hitter, or in some rotations the opposite hitter or right side hitter plays in this position. "Middle front" is the position in the attack zone (or front row) on the middle of the court. This position can be called "middle front", position 3, P3, "zone 3" , "Z3" . The middle hitter plays in this position in all the rotations. "Right front" is the position in the attack zone (or front row) on the middle of the court. This position can be called "right front", position 2, P2, "zone 3" , "Z3" . 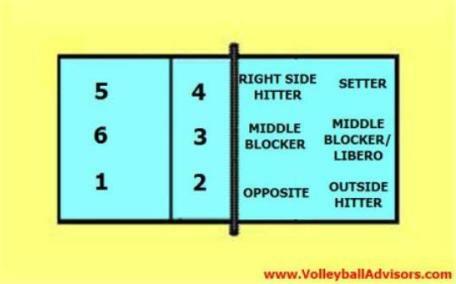 The right side hitter, opposite hitter or setter plays in position 2.